b) Open the action, check chamber, elevator and magazine tube to be certain firearm is unloaded. Do not use bent or deformed tubes as these may result in tube or barrel damage upon firing. Inspect tubes periodically to insure they are properly installed and in good condition. Never fire the gun without a choke tube properly installed. Failure to do so will damage the precision threads on the inside of the barrel. CARE & CLEANING: The precision threads on your choke tube should be kept clean and lightly oiled at all times. During cleaning of the barrel, be certain a choke tube is properly installed. This will avoid residue build-up on threads. The "Improved Cylinder* choke tube will usually produce the best accuracy with most slugs. ACCU-CHOKE TUBES - are designed for Lead and Steel Shot Patterns. STEEL SHOT can be fired through Accu-choke tubes however, better steel shot patterns may be obtained by using ACCU-STEEL choke tubes. To remove choke tube, loosen it with the choke wrench provided, turning counter -clockwise. When loose, remove completely with fingers, put choke on a clean dry surface. To install choke tube, first screw the tube clockwise into barrel by hand and then tighten the tube until snug with a choke wrench. Do not use excessive force when installing. Tube tightness should be checked periodically. ACCU-STEEL TUBES - have been specifically designed for exceptional endurance and controlled patterning of steel shot. These tubes will provide the best pattern results for the steel shot sizes stamped on each tube. Lead shot may be used with ACCU-STEEL tubes; however, pattern tests should be made to compare the pattern change. To remove choke tube, loosen with a choke wrench provided, turning counterclockwise. When loose, remove completely with fingers, put choke on a clean dry surface. ACCU-STEEL tubes protrude beyond the muzzle and are designed specifically for steel shot Choke designations are marked on each tube for specific steel shot sizes. Should your firearm require service that necessitates shipping the firearm to an authorized Service Center, kindly follow these instructions. 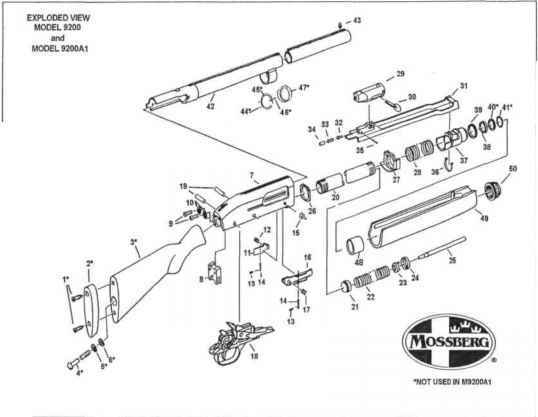 We reserve the right to refuse service on Mossberg firearms which have had modification and or removal of metal from the firearm, including, but not limited to, the barrel, chamber, receiver, and trigger assembly, or safety mechanism. We must restore the firearm to factory original mechanical condition and charge for this work. We do not accept C.O.D. shipments. Include with your firearm a clear description of the problem and service you wish for us to perform. Please give us a clear ship-to address, (no P.O. box numbers), your daytime phone number and if possible, fax number. We suggest you place your correspondence inside the package. If you have questions, please call us at 1-203-230-5400. We'll be happy to send you our latest Parts/Price Catalog. Call us at 1-203-230-5400. We'll need your name, address, city, state, and zip code. To order parts from us - You may call your order to us at 1-203-230-5400 or you may fax your order to 1-203-230-5479. Please provide your name, address, city, state, zip and phone number. We'll need Model #, Serial #, Gauge, Finish, Part # and Part name. We have a $7.50 (U.S.) minimum parts order charge. We accept most major credit cards, personal checks, money orders, and bank drafts. Service outside of the U.S.A.
For Mossberg firearm parts and service requirements outside of the United States, customers are requested to contact the closest Mossberg stocking dealer/distributor. 1. Make absolutely certain your gun is unloaded. 2. Do not send ammunition with your gun. Where to buy accu accusteel 12 guage fullteel choke tubes? Is acuchoke safe for steel shot?